The mission statement is : "To find the consistently best performing all round mountain runners." The latest rankings for top 10 men and women of Mountain Running are shown below. The ranking is a 12 month rolling ranking where the race results from the past 12 months are used to calculate the points and define who are the most successful mountain runners right now! 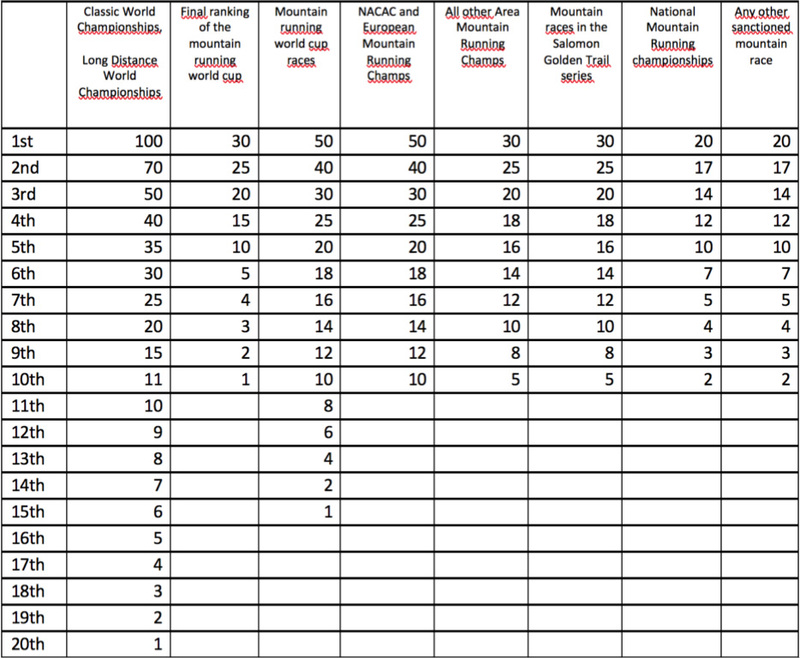 The internal wmra-pool responsible for managing this project examined and monitored 58 races to produce this preliminary World ranking for all athletes involved in mountain running competitions. The full table of all runners and results will be posted online soon. At the meeting of the 2018 WMRA Congress before the World Championship races there was an opportunity to present to the Mountain Running community the new initiative of the Mountain Running World Ranking project. 28 x Sanctioned races chosen among the IAAF Label mountain races, the most long-lived and well organized from an organizational and competitive point of view. 49 x Races that have already been accounted for, recently there has been added two events including the IAAF/WMRA Mountain Running World Championship and the Golden Trail Series (ISF Championships) stage at Ring Of Steall in Scotland. This first test analysis had to take into consideration the results of 344 MALE ATHLETES and 328 FEMALE ATHLETES that led to the drafting of this new update. The experience is proving extremely positive and interesting and WMRA intends to continue with the project by identifying in concert with IAAF a pool of race events in order to prepare a dedicated website to the Ranking. This team is in charge of taking care of contacts with the organizers of the selected races, monitoring in real time events and above all taking care of all relative communication to the media. In the two top-10s, at the date of this current update we find athletes from a wide range of countries and with different specialist off road abilities but the ranking value of each confirms that the best mountain running athletes are those who compare themselves with others several times during the season, taking part in the most important events to identify and create a sense of belonging to this sport that can be easily recognisable by the fans.